When you’re wedding planning, it’s so helpful to look at other couples’ weddings for inspiration. Today on my blog, I’m featuring a sneak peek into Coronation Street’s Tina O’Brien’s wedding. 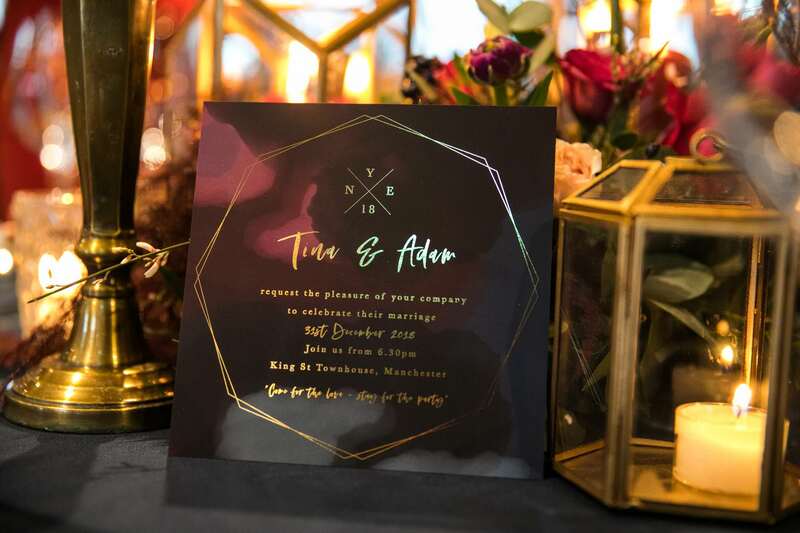 Tina’s wedding to Adam took place on New Year’s Eve at King Street Townhouse in Manchester. Firstly, I need to make it clear I was not the official photographer for this celebrity wedding! 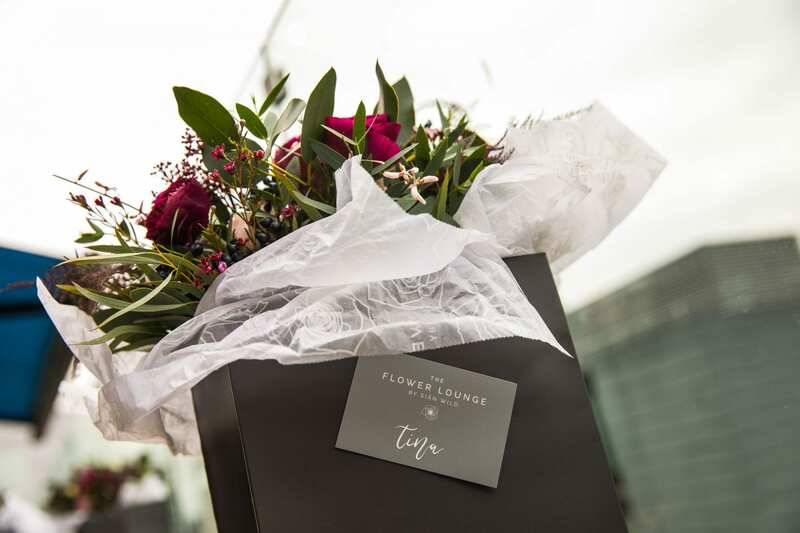 Sian from The Flower Lounge asked me along to take some pictures of her wonderful floral arrangements. If you’d like to see Tina & Adam’s wedding in full, you’ll need to grab a copy of OK Magazine to read all about it. I think you’ll agree that the Manchester wedding suppliers that worked on this big day did a fantastic job! It made me proud to see the suppliers I work with regularly and recommend, like The Flower Lounge and Marie Antionette Cakes, creating something special. 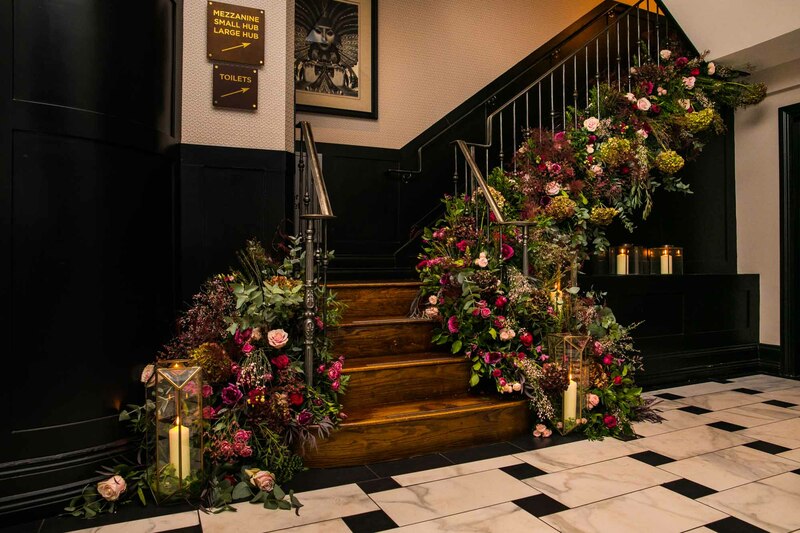 Together these suppliers had transformed King Street Townhouse Hotel into a glamorous setting ready for a big NYE wedding. It just shows the importance of choosing suppliers who are great at what they do. They can make your ideas for your wedding a reality. I think you’ll find these wedding photographs inspiring if you are planning a New Years Eve wedding. 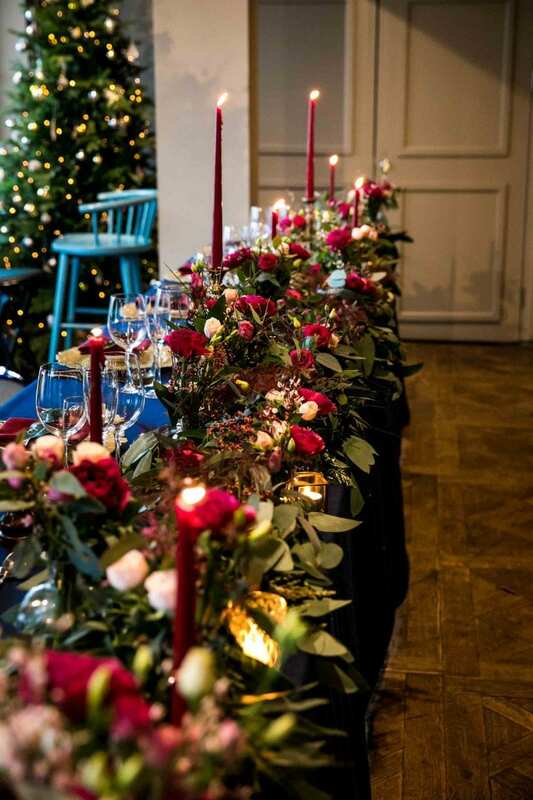 Or a winter wedding! 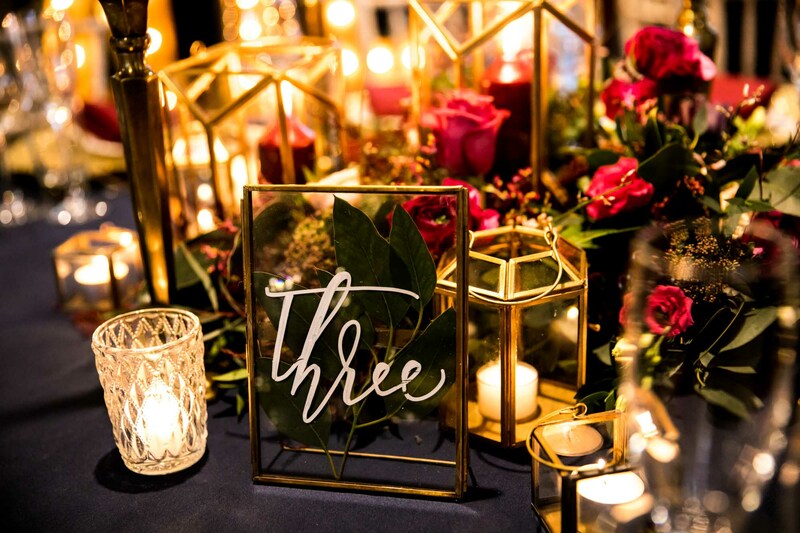 The darker, jewel tones used for the decorations, stationery and flowers are perfect for glamming up a dark night. Regular visitors to my blog will know I’m a big fan of colour. I think these richer tones work so well for winter. Even if you were having a later ceremony in the summer, this theme would also be lovely! Rachel from Marie Antionette Cakes designed and baked the gorgeous wedding cake. 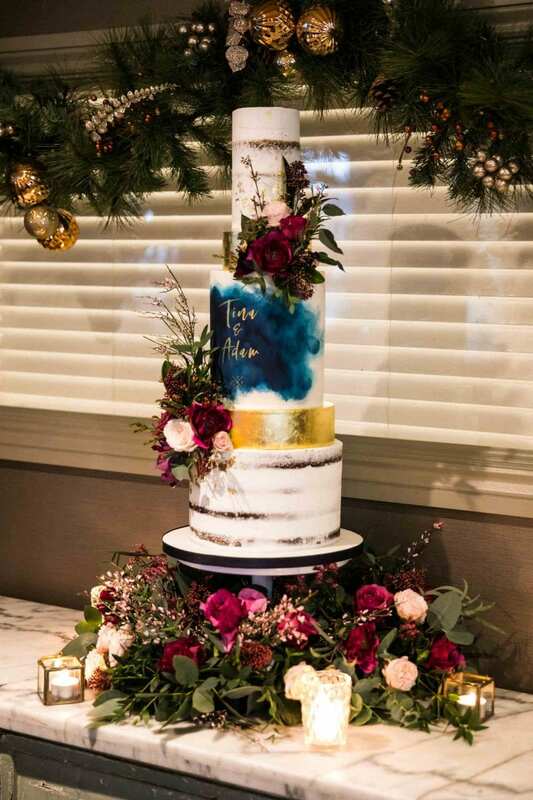 It featured four tiers of nearly naked sponge and gold leaf cake in different flavours, with Tin & Adam’s names hand painted onto the cake. It looked amazing and I bet it tasted better. How disappointing I didn’t get to eat any! 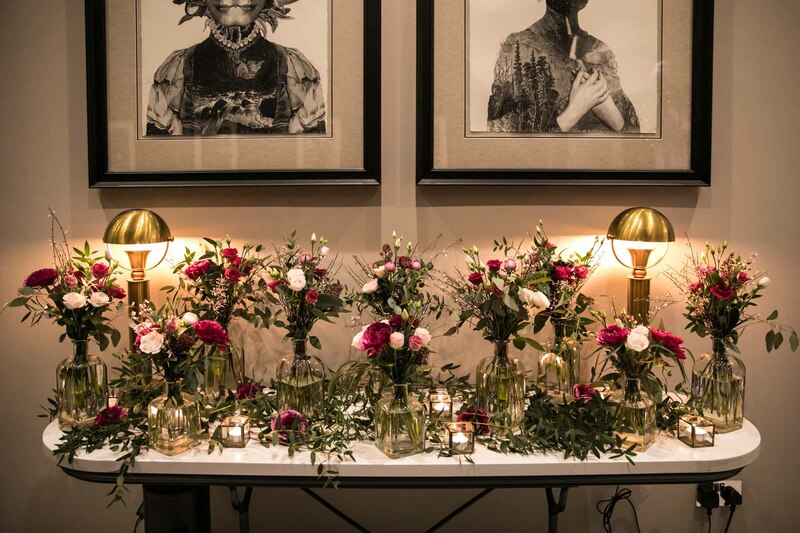 The venue dressing from The Soiree Stylists pulled the whole look together. As I’ve mentioned before, the colour scheme of deep reds, blues and gold worked so well together. 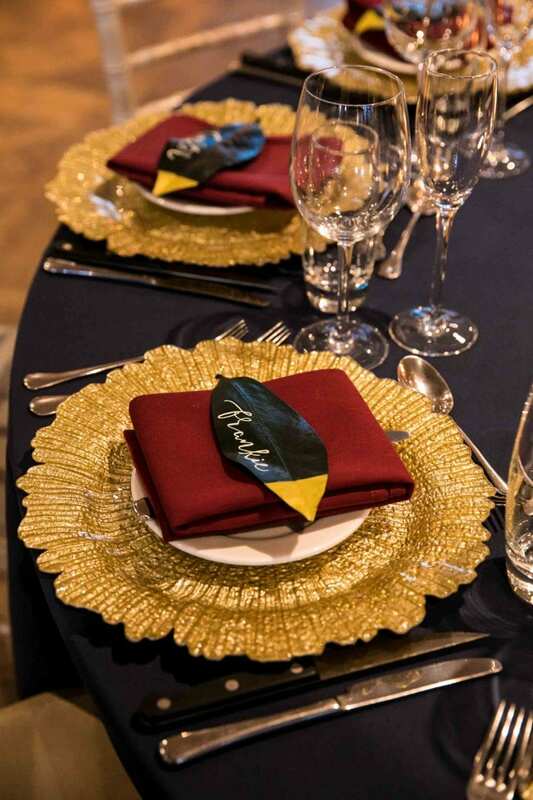 I loved the navy tablecloths and gold charger plates used on the table centres. 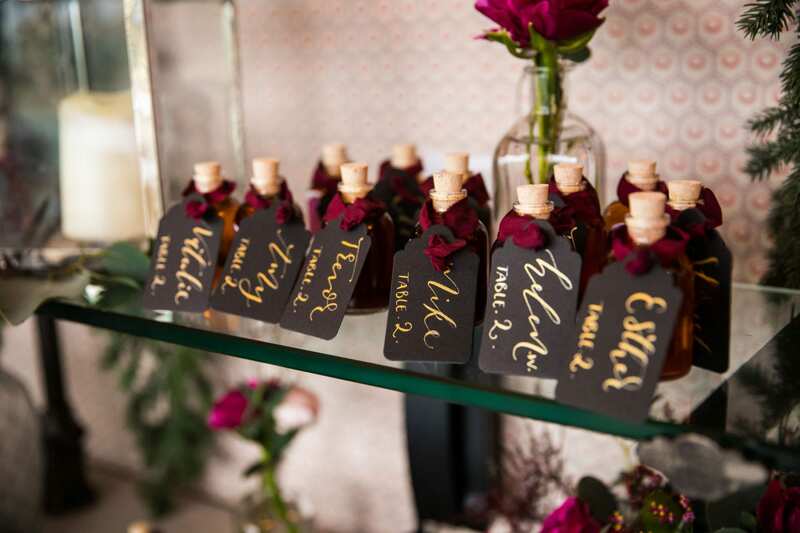 The table plan of little shot bottles was also a really pretty touch. 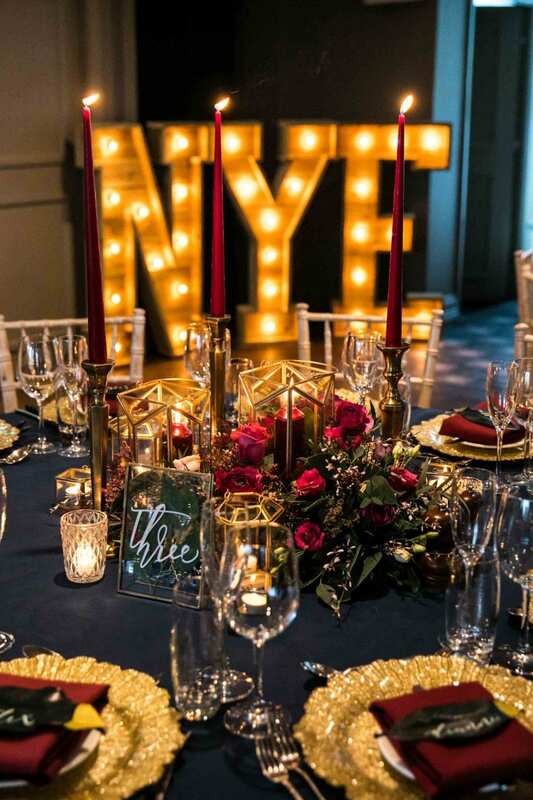 Lastly, the NYE light up letters from The Word is Love and the stationery from Knock Knock Penny added the finishing touches to make everything look amazing. 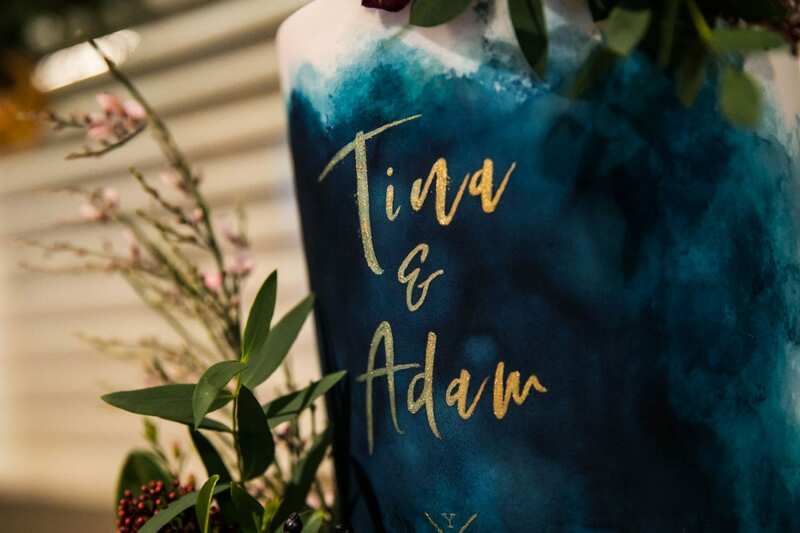 I’m sure Tina & Adam must have been delighted with how everything turned out. 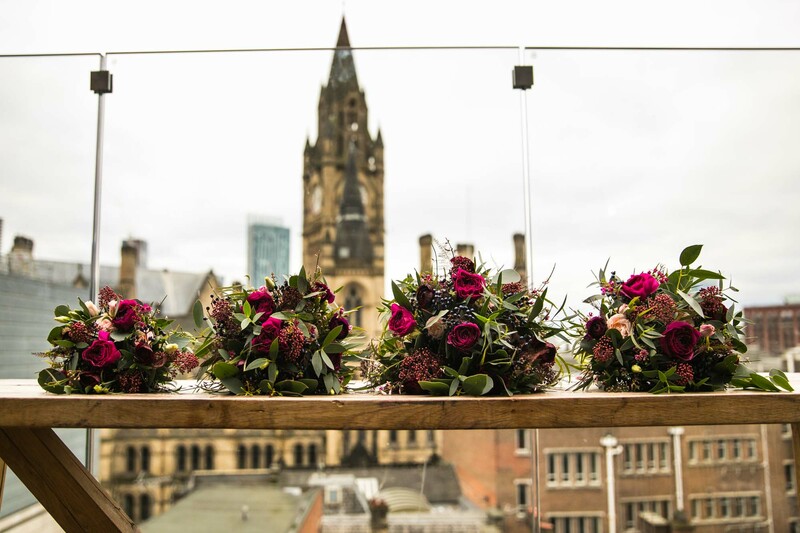 King Street Townhouse is a fantastic city centre wedding venue in Manchester. It is located just a stones throw from the iconic Manchester Town Hall. 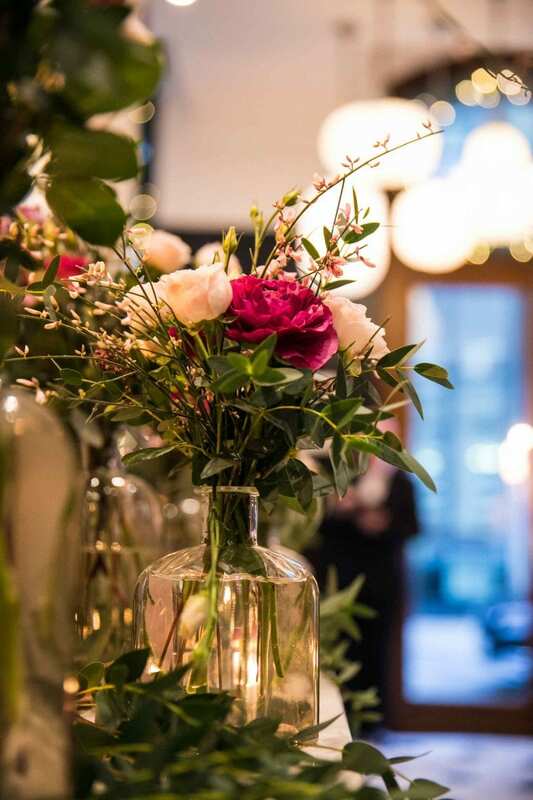 The interior is decorated in a quirky boutique style and as such provides the perfect backdrop for a stylish wedding celebration. 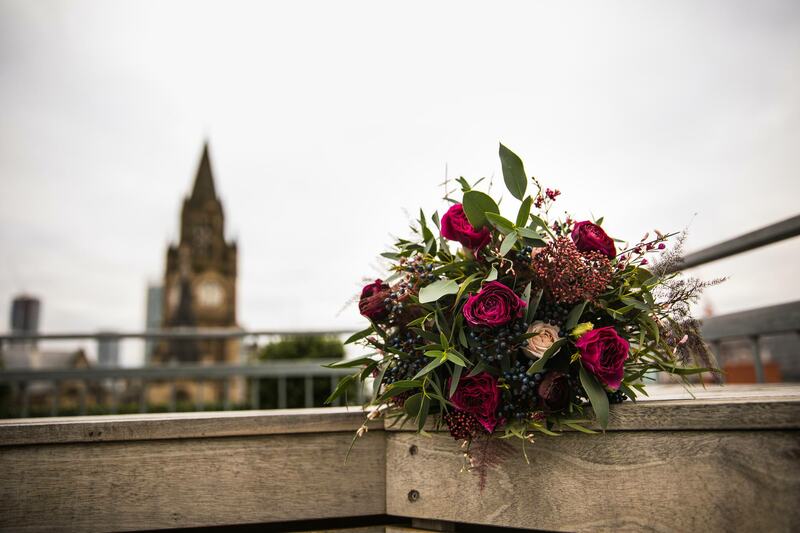 The rooftop terrace is brilliant for wedding photographs with the Manchester skyline and is a lovely place to take in the sunset on your big day. 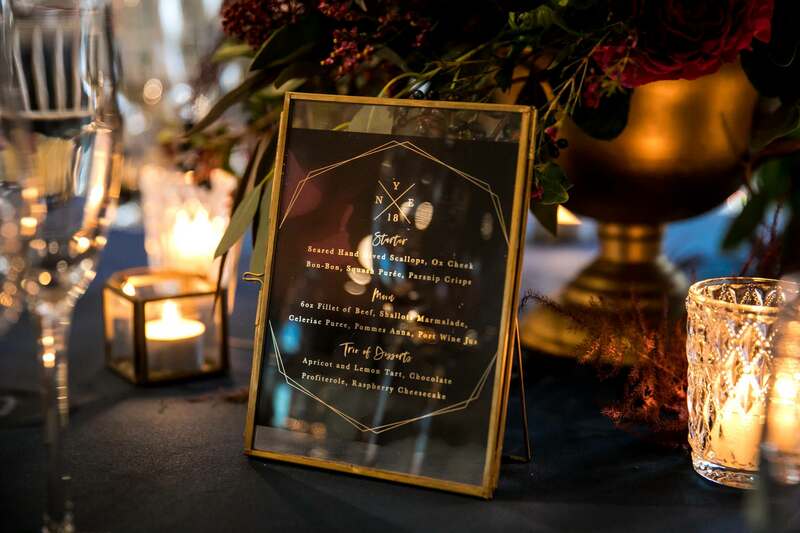 King Street Townhouse is fast becoming one of my favourite urban wedding venues thanks to its great location and party atmosphere! 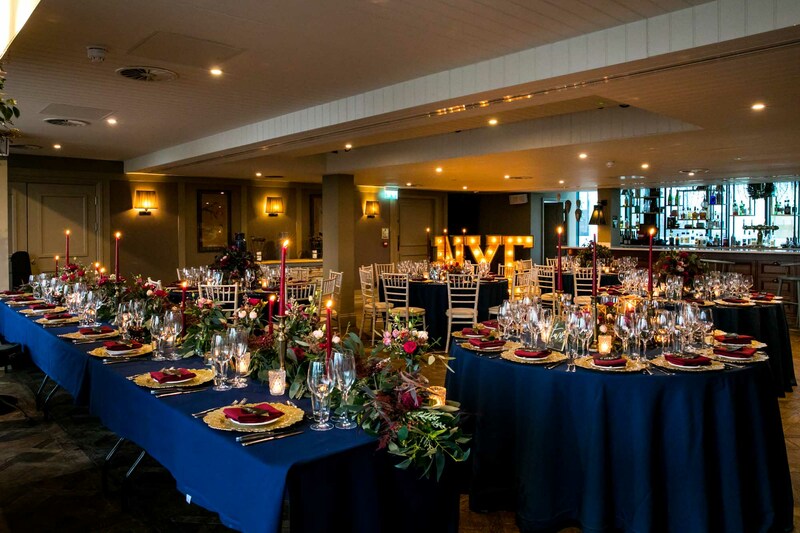 If you’re planning a NYE wedding King Street Townhouse like Tina & Adam, I would love to hear from you. Simply fill out the contact form at my website and I’ll send you my brochure and book a consultation for you. You might also want to check out other Manchester wedding photography from King Street Townhouse at my blog, such as Sheena & Paul’s King Street Townhouse Wedding Photos.